A very good resemblence to a white 1980 Toyota Celica. Even the hood opens up in the same way as a real Celica (although there's no engine inside... duh). 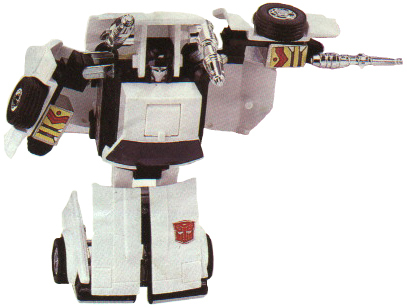 The tyres are rubber (a typical feature of Transformers back then). Flip up the dual barrels on the roof. Flip down the doors and attach the appropriate guns to them. That's it. Looks like a deformed MASK vehicle. Let's move along now. Pop the roof gun back in and take off the door guns. Pull front section forward. Grip onto the front side panels and turn the rest of the toy up 90 degrees (so it's now standing). Pull the front section apart to complete robot legs. Pull back panels out and the boot door will fall back into place, revealling robot head. Swing robot arms down. The guns that were on the door can be placed in two pegs just above the head. Put gun in robot fist. Yay. A very nice looking robot mode. Standing at 10 cm, it's about the same size as most Autobot cars. Feel them forearms and underside of the feet. That's die-cast metal, yesss. By 1980s standards, it's a pretty good toy. But how would it stand up against today's discerning toy collector? Although the great moulding and details would entice most collectors, there are two main features which may repel some. Firstly, this toy only really has four points of articulation. The shoulders and elbows. That's it! Secondly, see the way that white boot door hangs over the head? See the way those white door panels stick out? Yep... it has a strong resemblance to the Flying Nun. Furthermore, the toy can't really stand up straight because it has a tendency to rock on it's wheels. There are two variations of this toy, one with white "Celica" plates and another with 'regular' plates. The former is rarer. A pretty good toy for its time and certainly worth it for collectors (especially the Celica plate variant).